WhiteLight wrote: Hate to be pedantic Ed ( nah not really , i enjoy it ) but isn't it INEDIBLE ? Not according to my dictionary, "Dictionary.com"
not suitable for food [syn: inedible] [ant: comestible] """"""
I think I'm in the clear. If I wasn't, I would have claimed poetic licence! I think its actually refered to as ... having a bit of fun ! So you want back on topic do you ? Whats your take on this photo Osmosis ? http://marsrover.nasa.gov/gallery/all/2 ... 25L7M1.JPG ? ? Sleepers and skulls--It looks like the outskirts of a Nevada ghost town. A scale in the scenes would be handy. I see other slabs of petrified wood in the background and to the right of the main slab. There's a "flyby" video which, if it's the same as what they're putting on TV, is worth checking out. are probably due to the variation in electrical conductivity caused by irregularities in the thickness of underlying layers. The areas of lower resistance will become increasingly deeper when the next 'wind' blows, as they will concentrate current flows. The vertical fractures also concentrate the charge, producing what look like stream beds intersected by gullies. I think my explanations make more sense that those of NASA. * I originally posted them on this board under the thread "New Images from Mars". But for some reason the moderators moved them to the New Insights board and labeled them Hoagland Mars Images, although I don't know that Hoagland had anything to do with them. I think Joseph somebody came up with them. He interprets them as life forms etc, but they look to me like electric discharge formations. I'd noticed this before in an image, but this one is much more convincing. There are small 'craters' in what appear to be the very steep sides of the 'crater' wall,(top of image) that seem to have impacted perpendicular to the slope. Surely, an impactor coming straight down would have left a long gouge? As for the rest of the image, if that isn't electrical/plasma action, I don't know what is. How long can the lie survive? And just look at this fresh crater rim! What grabbed my attention more than the perpendicular craters in the wall, was where the wall intersects the floor. I'm seeing something very odd there; as if the wall were gauzy and semi-transparent, with the "floor" faintly showing through from "behind" it. And on the left side of the image, the intersection looks blurred and smudged and completely devoid of the same degree of detail as the rest of the image. Am I trippin' or what? 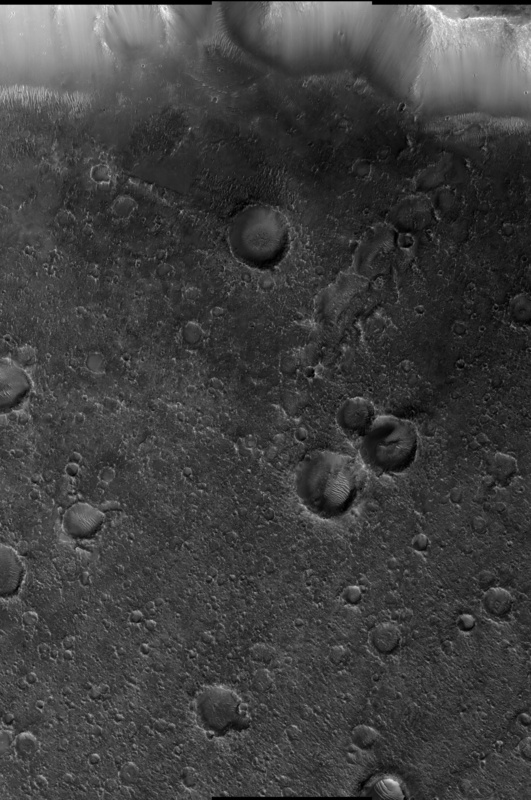 I've looked through about half of the 81 HIRISE anaglyphs (R-B stereo views) and did not see any that depicted those odd round craters in steep walls. A meteorite with an oblique incidence against a steep wall should at least show some ejecta around it, particularly a pattern below it where the impact could have shattered the lower impact rim and permitted slumping of the contents in a visible pattern "down the hill" from the impact. No, you are seeing correctly. I pointed out something similar a while ago, in Candor Chasm, I think. So is it the 'wind' blowing dust around, or is it, as I suspect, ongoing dissociation of the surface by plasma? Levitating dust clouds have been observed on the moon, and thats what this may be, but I think there may well be ongoing surface modification, so that the 'craters' grow sporadically. The crater rim glows observed on the moon are probably a good sign that further 'weathering' is occuring. GaryN wrote: I'd noticed this before in an image, but this one is much more convincing. There are small 'craters' in what appear to be the very steep sides of the 'crater' wall,(top of image) that seem to have impacted perpendicular to the slope. Surely, an impactor coming straight down would have left a long gouge? Also, recall that Victoria Crater has the same "Dune Field" on its floor, as the "craters" in the above HIRISE views. Ramparts are signs of water?? (bautforum) DippyHippy I also think a fair portion of those who advocate these ideas are conspiracy theorists. It's just the way the theories are presented... like they're accusing the scientists of being incompetent, stuck in their ways, lying or just plain blind to the apparently obvious." 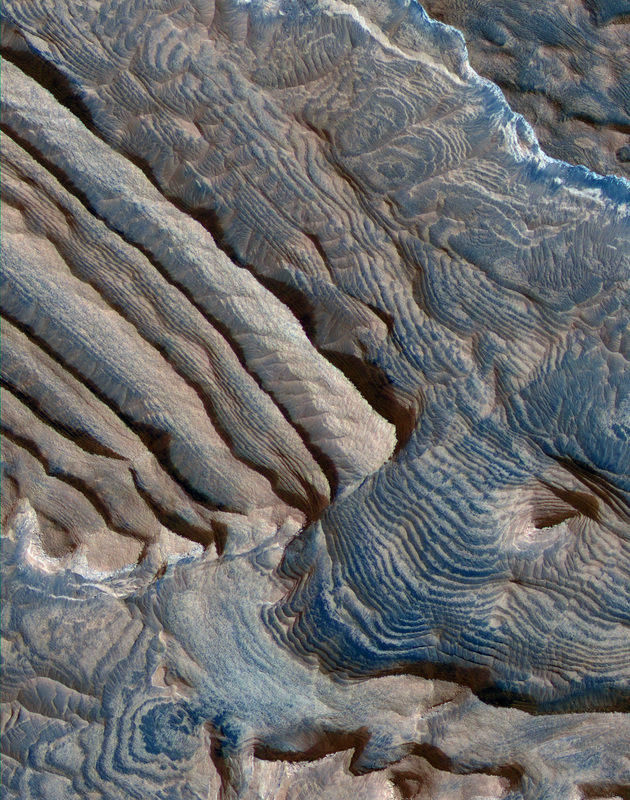 I went to the MRO after seeing these http://www.telegraph.co.uk/science/picture-galleries/6544429/Surface-of-the-Red-Planet-images-from-NASAs-Mars-Reconnaissance-Orbiter-satellite.html?image=1 great images of predominately PDM or plasma discharge machining effects on Mars, that are unwittingly passed off as 'curious' and 'pretty' and of course always assumed to always be from volcanic, weathered or impact sourced causes. This ridge is an obvious PDM scar right? C'mon, almost all of the mountains I see on earth to me seem to have some source in PDM effects. Because of this, rampart craters can be used to indicate the past presence of water or ice in the Martian crust. Surely they cannot be serious, is this the definition of a tautology?